In a medium saucepan, simmer the port over moderate heat until syrupy and reduced to 1 cup, about 15 minutes. Whisk in the butter, cherries and olives and season with salt and pepper. Keep the sauce warm. Meanwhile, preheat the oven to 425°. Set a rack over a rimmed baking sheet. 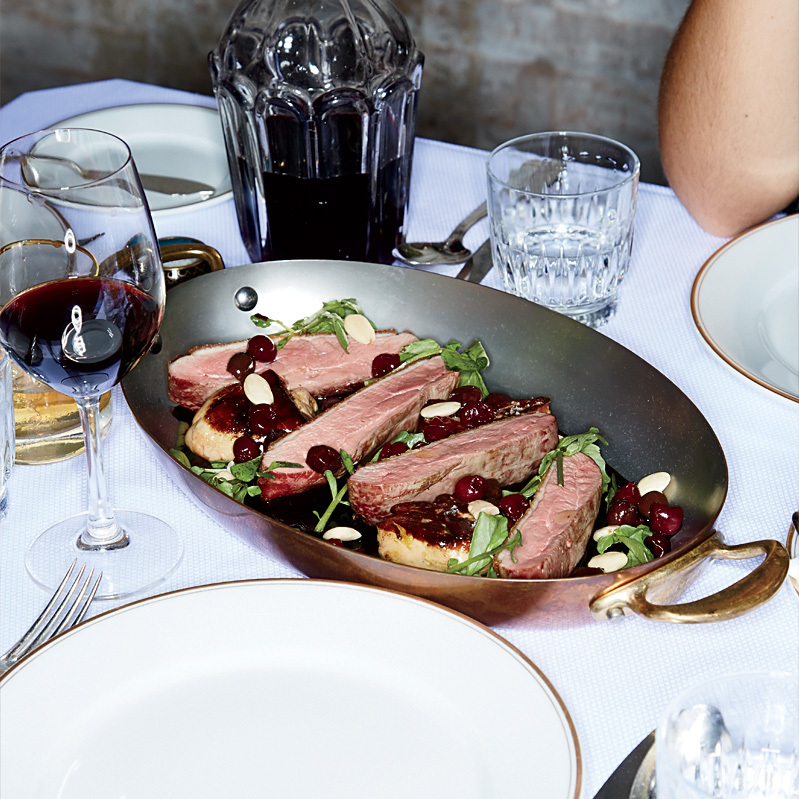 In a large ovenproof skillet, cook 2 of the duck breasts skin side down over moderately low heat until the fat renders and the skin is browned and crispy, about 10 minutes. Transfer the duck to the rack skin side up. Discard the fat. Repeat with the remaining 2 duck breasts. Transfer the duck to the oven and roast until an instant-read thermometer inserted in the thickest part of the breasts registers 130° for medium-rare, about 15 minutes. Transfer to a cutting board and let rest for 10 minutes. Slice the duck breasts 1/3 inch thick. Leave the oven on. Clean the skillet, wipe it dry and heat until very hot. Add half of the foie gras and cook over high heat until deep golden, about 30 seconds. Flip the foie gras and roast in the oven until just cooked through, about 3 minutes longer. Transfer to a paper towel–lined plate to drain. Repeat with the remaining foie gras. Arrange the duck and foie gras on a platter and spoon over the sauce. Garnish with almonds and watercress; serve.